Oscar-winning director Ron Howard brings to the screen writer Peter Morgan's ("The Queen," "The Last King of Scotland") electrifying battle between Richard Nixon, the disgraced president with a legacy to save, and David Frost, a jet-setting television personality with a name to make, in the untold story of the historic encounter that changed both: "Frost/Nixon." Reprising their roles from Morgan's stageplay are Frank Langella, who won a Tony for his portrayal of Nixon, and Michael Sheen, who fully inhabited the part of Frost onstage in London and New York. For three years after being forced from office, Nixon remained silent. But in summer 1977, the steely, cunning former commander-in-chief agreed to sit for one all-inclusive interview to confront the questions of his time in office and the Watergate scandal that ended his presidency. Nixon surprised everyone in selecting Frost as his televised confessor, intending to easily outfox the breezy British showman and secure a place in the hearts and minds of Americans. Likewise, Frost's team harbored doubts about their boss' ability to hold his own. But as cameras rolled, a charged battle of wits resulted. Would Nixon evade questions of his role in one of the nation's greatest disgraces? Or would Frost confound critics and bravely demand accountability from the man who'd built a career out of stonewalling? Over the course of their encounter, each man would reveal his own insecurities, ego and reserves of dignity--ultimately setting aside posturing in a stunning display of unvarnished truth. 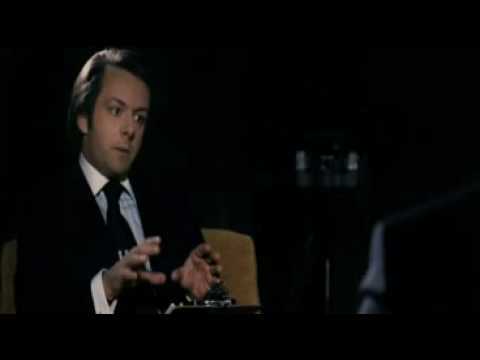 "Frost/Nixon" not only re-creates the on-air interview, but the weeks of around-the-world, behind-the-scenes maneuvering between the two men and their camps as negotiations were struck, deals were made and secrets revealed...all leading to the moment when they would sit facing one another in the court of public opinion. "Frost/Nixon" is a collaboration between Imagine Entertainment and Working Title Films, with Academy Award winners Brian Grazer and Ron Howard joining Tim Bevan and Eric Fellner as producers. Joining Langella and Sheen as the colorful real-life personalities who provide the men counsel is a formidable roster of actors including Kevin Bacon, Oliver Platt, Sam Rockwell, Toby Jones and Matthew Macfadyen.